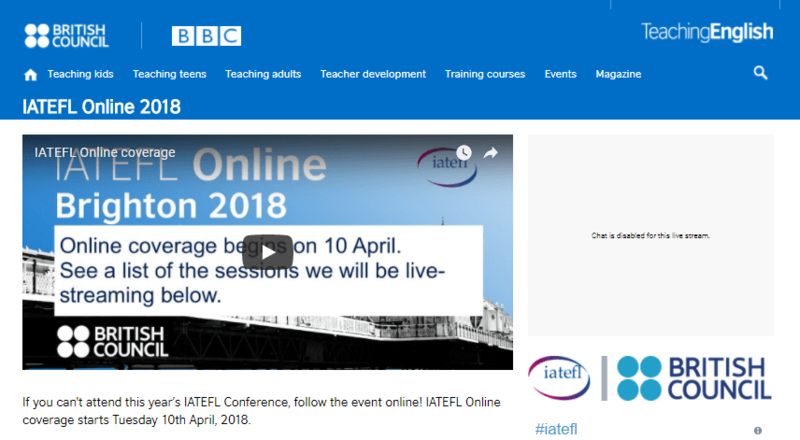 IATEFL has embraced sharing its most recent conferences by streaming many of its plenaries and concurrent sessions live since 2011, and archiving them for anyone to view, online without having to be an IATEFL member. Previously the archives were left online temporarily or more permanently to paid members, but recently they started webcasting most of the conference and left the archive up online, free for anyone with the link, and they appear to have gone back and done the same with the entire archive. 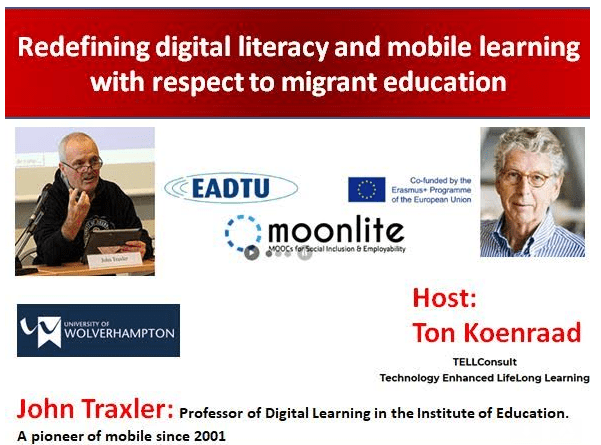 These presentations cover a wide spectrum of pedagogical issues in teaching in foreign language contexts, whereas the TESOL CALL-IS webcasts (see previous post in this blog) focus on technology in language teaching. In contrast, as noted at the end of my last year’s blog post on the 2017 IATEFL conference, https://learning2gether.net/2017/04/07/learning2gether-with-iatefl-2017-glasgow/, TESOL records many of its presentations and offers them for sale. The link given at the end of that post, http://tesol.sclivelearningcenter.com/index.aspx?PID=8529, still works, and offers recordings of selected sessions from TESOL 2018 for $149 US dollars. In April 2016, after enjoying sessions from the 2016 IATEFL conference online that year, I posted in my blog my answer to the question, Can a paradigm shift in conference business models reverse declining attendance at face to face conferences? Ostensibly, the post was triggered by a question in the 2016 TESOL conference attendee survey: If you have any suggestions or comments regarding how we could improve the convention and/or English Language Expo, please enter them in the box below. Going IATEFL one better, recordings should all go to a permanent online archive openly accessible to all, not just TESOL members. Counter-intuitively to some, this would not prevent members from attending or paying dues to any significant degree, but through the appreciation of those who could not attend, it would stimulate growth since it would create an aura of rock star English teachers and give non or lapsed members an incentive of great value this day and age to come and join in such a forward-thinking organization, and to attend conferences where they felt they ‘knew’ some of the people they would meet there thanks to their online presence, and would want to connect with them both online and personally. So we do find a decline in membership numbers over the past decade, and most likely a decline in attendance at TESOL conferences. I have been to most TESOL conferences this century, and into the last as well. Many of my colleagues declined to attend this year, mainly for economic reasons (no funding, registration at the conference can top $500) and though the experience is always worthwhile for me personally, the network is diminishing. I’m not able to find annual stats for IATEFL, but its web site claims over 4,000 members at present. It would be interesting to see if that is a growing, diminishing, or as with TESOL a fairly steady number over the past decade. IATEFL, in contrast to TESOL, is catering to a smaller audience perhaps but producing rock stars. And this has to be the shape of blended conferences going forward. My next conference (after WorldCALL in Chile this November) might just be an IATEFL one. This post reflects on a critical difference between two recent major international conferences, IATEFL in Brighton and TESOL in Chicago. I attended both, the one in Chicago, physically in the windy city, and the one in Brighton, virtually. I spent thousands of dollars from my teacher’s salary to attend the former, and nothing to attend the latter. However, the profit may accrue to IATEFL, the one I might be more likely to support on a sustained basis, considering that it’s more in line with a teacher’s desire to share good work without charging those who can ill afford it for every aspect of it (analogous to the mindset driving medical care in America vs that in UK). Our next VSTE VE PLN meeting is in Minecraft! You are receiving this email because you are whitelisted in VSTE Place, the Virginia Society for Technology in Education’s Minecraft server. Please let me know if you wish to be removed. It is not my intention to spam you. There are building spaces set up for you at /warp schoolwork already. (Just type that into chat and you will get there.) If you need more space add it nearby. Please post signs that give your Minecraft name, project name, and grade level. Feel free to build more than one project. We will leave this up as an exhibit for teachers new to Minecraft. You won’t have to enroll, but there won’t be certificates either. I’ll insist nevertheless on participants entering their FULL names (first name PLUS last name).